A couple of weeks ago, I sorted several hundred books following Marie Kondō’s system for tidying. It was my first big collection of material items that needed a serious KonMari makeover. 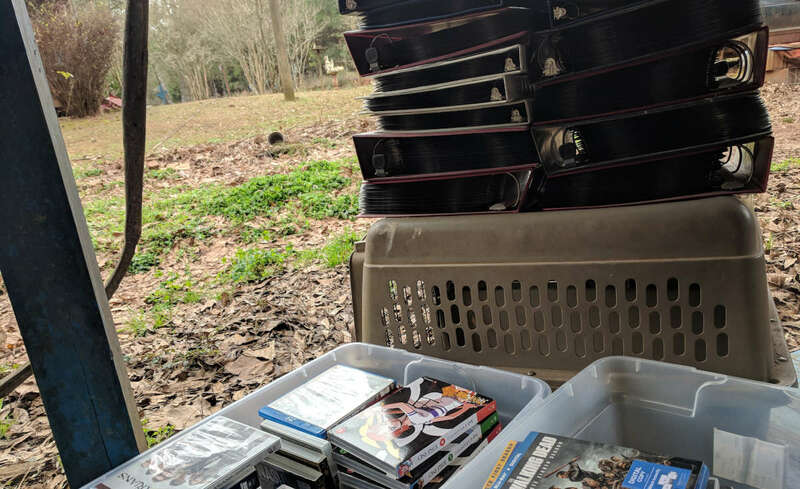 While it was tough in some ways, it was a downright breeze in comparison to this weekend’s challenge: DVDs, Blu ray discs, and a couple of useless HD DVDs that I at one point thought would win the format war. Lesson #4 under Kondō’s direction is komono (miscellaneous items). This is the largest category and encompasses many sub-categories. It’s best to break each of the sub-categories down and tackle them one at a time. For me, movies and TV shows on DVD is the largest collection of things that I own. I thought it best to handle this job first with the hope that everything else would seem easy in comparison. Because I’m taking this journey on the weekends only, I actually failed to finish sorting my entire collection in the span of two days. I vastly underestimated how much work it’d be. I got a lot of good work in over the weekend, and it helped me figure out some different ways to tackle the collection. The question Kondō asks about each item you own is whether it sparks joy. I’ve been building my collection for going on 18 years. I’ve rummaged garage sales, flea markets, and bargain bins for cheap DVDs. If it even seemed remotely watchable, I’d pick it up. If there’s anything that I’ve ever truly hoarded, it was DVDs. I’ve slowed down a lot in the past couple of years, mostly only purchasing movies and such that I really wanted. But, I’d still pick up the occasional cheap flick. A while back, my collection had grown so big that I had to start organizing them into smaller sleeves or binders. The movies comfortably fit into a few boxes, but my TV collection was unreal (as shown in the photo at the beginning of this post). Whether something sparked joy for me didn’t seem the appropriate question. My collection makes me happy. I enjoy always having something available to pick up and watch from a wide variety of genres. The question I asked myself is whether I’d ever watch a particular movie or series again. That proved to be a good gauge in deciding how I felt about holding onto something. On the first day, I blew through the movies. I had well over 100 films that I knew for a fact would never be placed in my DVD player again. They’d served their purpose and provided the joy necessary in the moment that I first watched them. Where I hit a roadblock was with the TV series on the second day. I simply ran out of time to get into the more organizational aspects of the KonMari system. I mostly finished discarding shows that I wouldn’t watch again, but I’d like to do another solid pass. One of my major plans is to rip all of my movies and shows onto a solid storage system with backups. That’s going to be a time-consuming and likely years-long job that goes beyond KonMari. It’s something I need to do because DVDs, no matter how well you take care of them, don’t necessarily last forever. And, it’d be a lot easier to play them on a computer or over the network (maybe with something like Plex Media Server). My current plan is to make a vow to not watch anything unless I’ve first ripped it. That way, I can hold myself accountable to this enormous task of cataloging the collection. I figure I’ll get around to everything eventually as I cycle through my movies and shows. In the meantime, I’m going to jump into another sub-category of komono next weekend and continue down this journey.